Basic Civitas Books, 9780465070503, 304pp. On February 29th, 2004 the democratically elected president of Haiti, Jean-Bertrand Aristide, was forced to leave his country. The twice elected President was kidnapped, along with his Haitian-American wife, American soldiers and flown, against his will, to the isolated Central African Republic. Although the American government has denied ousting Aristide it was clear that the Haitian people’s most recent attempt at self-determination had not been crushed by Haitian paramilitaries as Washington claimed. In An Unbroken Agony, bestselling author and social justice advocate Randall Robinson explores the heroic and tragic history of Haiti. He traces the history of a people forced across the Atlantic in chains; recounting their spectacularly successful slave revolt against France and the two hundred years of reprisals that would follow. The fate of Aristide’s presidency is tied to this people’s century-long quest for self-determination and his removal from power exposes the apartheid-like forces that frustrate these aspirations even today. Robinson majestically chronicles the convulsive history of this island nation-from Columbus’s arrival to the fearlessness of the slave revolutionaries who defeated the armies of Napoleon Bonaparte in 1804, wresting from France the most valuable colony of any European power anywhere in the world; from the ideals of the young republic, to the foreign backed dictators who corrupted those ideals, culminating in the American led operation removing from power Haiti’s first democratically elected president and his entire government in 2004. 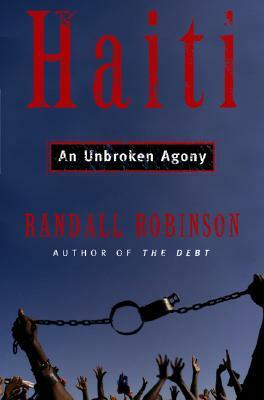 Robinson captures the pride and courage of the Haitian people in the face of seemingly insurmountable odds. With his passionate prose, Robinson brings alive the powerful memory of the Haitian revolution in the souls of ordinary citizens and shows the boundless desire of all Haitians to chart their own destiny-free of foreign interference. Randall Robinson is the author of the bestsellers The Debt, The Reckoning, and Defending the Spirit . He is also founder and past president of TransAfrica, the African-American organization he established to promote enlightened, constructive U.S. policies toward Africa and the Caribbean. In 1984, Robinson established the Free South Africa Movement and in 1994, his public advocacy, including a 27-day hunger strike, led to the UN multinational operation that restored Haiti's first democratically elected government to power. Mr. Robinson lives with his wife and daughter in St. Kitts.